You are here: Home / Health / Crazy Wart Girl, No More! This is embarrassing to share, but I’m going to in case anyone else has this problem. I get warts on my thumb and I’ve finally found a treatment that works! I’m not like crazy wart girl, but I’ve had 2 in my life and I’m vain, so I can’t handle them when I get one. The first one I got on my thumb took NINE years to go away. I tried everything…burning them off with dry ice (at the dermatologist) for weeks on end, OTC salicyclic acid, filing them down, duct tape, nail polish. Nothing worked. Then I got one on the other thumb and I really lost it. I couldn’t handle another wart. I like my thumbs too much for this to happen. I looked into essential oils, since I have a medicine cabinet full of them. 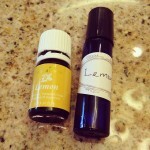 I started using lemon essential oil daily (1 drop on the wart each night) and in 3 weeks that freaking wart is gone. I don’t know why I’m so amazed because there are many essential oils that have anti-viral properties (warts are caused by a virus). I’m sure there are other essential oils that could have done the same thing. But I’m so happy that I keep finding more natural treatments that keep me out of the doctors office.